He's here to ruin all your video cassettes. His namesake? His namesake is a generator that produces small amounts of alternating current. Motorcycles use them because real batteries would be too heavy. A lawnmower might use one. A light you put on your bicycle could use one. Old fashioned telephones, where you had to turn a crank to talk to the switchboard operator? 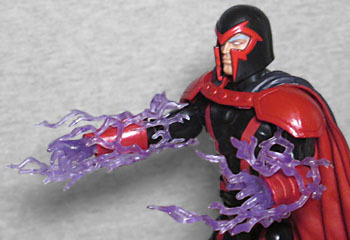 That was a magneto. So really, as far as power goes, Erik Lehnsherr going by "Magneto" would be like Max Dillon going by "Glow Stick." 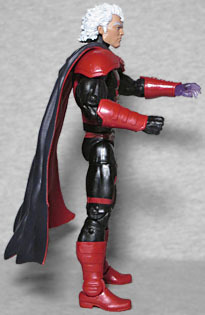 This is Magneto as he appeared during Marvel's "All-New, All-Different" branding, which is what came after Marvel NOW! and the Secret Wars crossover. It's a black suit with red accents - bracers, pauldrons, boots, stripes on the chest and legs - and the traditional Magneto helmet. 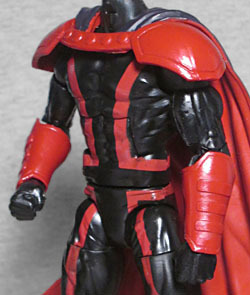 Like the last Magneto, the head and helmet are molded as separate pieces, but it's not removable. Fear not if you were hoping for an unimpeded view of his face - the figure comes with an alternate head, showing him with his helmet off (must not be any psychics around) and his thick hair blowing in the breeze. For a guy who must have been born in the 1920s at the latest, he's still rocking a pretty luxurious mane - thanks, comicbook time! It's a good thing there was that whole arc where he was reverted to a baby and then re-aged, or else he'd make no sense at all. Really, the whole body is better on this toy than the previous effort. It's the one we last reviewed on Prowler, which really means we're going to have to come up with a name for it and give it its own page on the blog, huh? Go to the message board and suggest a name for it, everybody! This is the body most easily identified by the wrinkles on the suit designed to look like cloth and not just painted skin. Maggy gets new armor on his forearms, and new boots. He's wearing a cape, of course, because that's his fashion sense, and it's molded with his shoulder armor and studded clavicular collar so that those can be more than just paint. The red stripes on his body end up darker than the armor, because the paint can only be so thick, you know? And it was either that or mold the body entirely in red and paint everything black, which would have been ridiculous, expensive, and ridiculously expensive. The articulation is usual: balljointed head, hinged neck, swivel/hinge shoulders, double-elbows, swivel/hinge wrists, hinged torso, swivel waist, balljointed hips, swivel thighs, double-knees, swivel boots, and swivel/hinge ankles. The helmeted head is a little bit loose on the balljoint, but the bare head is tight. The peg that holds his cape to his back is designed in such a way that it makes the cape billow out just a bit, making the figure 1) more dynamic, and 2) more back-heavy. So be careful when you're posing him. Curse you, gravity! There's also a part of the Apocalypse Build-A-Figure, the right arm. It's metallic blue, and has some massive veins on the inside of the upper arm to show that it's organic. 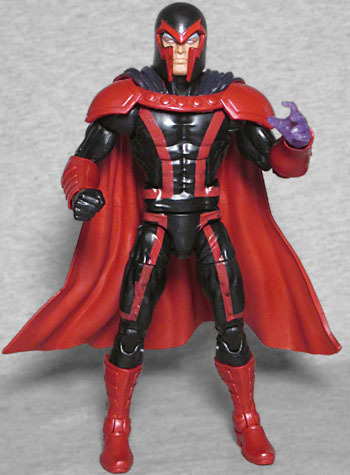 I'm not a giant fan of this costume (had to look it up to even figure out where it was from), but this is a great Magneto. I wouldn't be too surprised if this showed up repainted in classic red-and-purple in that retro "Vintage" line they're doing now. No, it doesn't have any villains, yet, but this mold could work there.